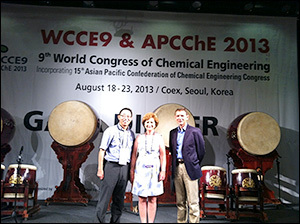 Left to right: Kyu Yong Choi, Maria Burka, and Ray Adomaitis at WCCE9. Department of Chemical and Biomolecular Engineering (ChBE) professors Ray Adomaitis (joint; Institute for Systems Research [ISR]) and Kyu Yong Choi recently attended and helped coordinate the 9th World Congress of Chemical Engineering (WCCE) in Seoul, Korea, the world's largest international chemical engineering conference. Joining them was colleague and former ChBE/ISR visiting professor Dr. Maria Burka (National Science Foundation and past president, American Institute of Chemical Engineers). The trio represented the United States on WCCE's International Advisory Committee, which is responsible for building a technical program designed to promote networking, presentation of state-of-the-at research, and new collaborations. They also coordinated chemical reaction engineering symposia focused on advanced applications, including nanomaterials, water, the environment, polymers, and energy. Choi presented his latest work on the role of silica support materials in olefin polymerization, while Adomaitis and Burka presented theirs on the mathematical modeling of the atomic layer deposition (ALD) process. "The four chemical reaction engineering symposia were the most heavily attended at the congress," Choi reports. "Many attendees I spoke to felt the papers presented at them were of the highest quality." WCCE draws participants from countries around the world, including the Americas, Asia, Europe, the Middle East, and Oceania. This year's activities and presentations reflected the theme "Chemical Engineering: Key to the Future" by emphasizing chemical engineering's role in areas including sustainability, energy, biotechnology, and information technology. Guests also discussed current trends in and issues affecting chemical engineering in academia and industry. One of the event's highlights was its banquet, at which guests were treated to a fashion show featuring traditional Korean royal attire and traditional music. Prior to the WCCE, Choi also attended the 2013 U.S.–Korea Conference, held in East Rutherford, NJ. Hosted by the Korean-American Scientists and Engineers Association of America, the weeklong event attracted approximately 1200 scientists and engineers from the U.S. and Korea, who participated in a program and job fair covering almost every field of science and engineering. Choi presented two papers at the conference on the topic of ultrahigh molecular weight polycarbonates and ethylene polymerization over metallocene catalysts, supported over silica of various geometries.